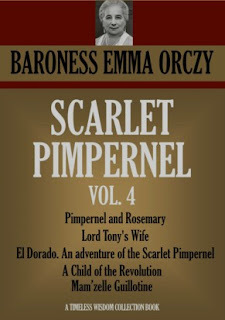 I knew that Baroness Orczy had written a lot of sequels to her most famous book, The Scarlet Pimpernel. What I didn't realise, until I started looking at a list of books published in 1924, was that she had written a modern-day version of the Pimpernel that was published in the magic year. I had somehow always thought of the Baroness as an Edwardian writer who wrote historical fiction & mysteries featuring Lady Molly of Scotland Yard or The Old Man in the Corner. She lived a very long life (1865-1947) & her final Pimpernel novel was published in 1940. Pimpernel and Rosemary features Peter Blakeney, great-great-grandson of the famous Sir Percy (in fact, he's the image of the famous Romney portrait of Sir Percy). Peter is a famous cricketer, was awarded a VC during the Great War &, as the book opens, is devastated by the news that the girl he loves, Rosemary Fowkes, is engaged to his friend, Jasper, Lord Tarkington. Rosemary is a respected journalist, beautiful & sought after. She was one of those women on whom Nature seemed to have showered ever one of her most precious gifts. There are few words that could adequately express the peculiar character of her beauty. She was tall and her figure was superb; had hair the colour of horse-chestnuts when first they fall out of their prickly green cases, and her skin was as delicately transparent as eggshell china; but Rosemary's charm did not lie in the colour of her hair or the quality of her skin. It lay in something more indefinable. Perhaps it was in her eyes. Surely, surely it was in her eyes. People were wont to say they were "haunting", like the eyes of a pixie or a fairy. Peter & Rosemary have been friends since childhood & she has spent time with the family of Peter's aristocratic Hungarian mother who live in Transylvania. Rosemary is in love with Peter but he had never quite committed himself to her so, disappointed by Peter's elusiveness, she agrees to marry Jasper, even though she's not in love with him. Jasper agrees that Rosemary should continue her career after their marriage, and, when she is challenged to visit Transylvania by the military Governor, General Naniescu, & see what conditions are really like, Rosemary agrees. A series of anonymous articles has recently appeared in the European Press & Rosemary is intrigued. She plans to write a series of candid articles about post-war conditions for the Hungarian minority & Naniescu assures her that she will not be censored. Jasper convinces her to marry him before the trip so that he can accompany her. Hungary has been devastated by the Great War. The country was carved up after the Armistice & Roumania has occupied the part of the country where the Imreys have their estate. The Hungarian aristocracy are persecuted by the new Communist regime & the Hungarians are virtually second class citizens in what used to be their country. General Naniescu has free rein to do what he wishes, far away from any central government control. Peter's aunt, Elza, Countess Imrey, has invited Rosemary to stay with her family at their estate, during her visit. Elza's son, Philip, & his young cousin, Anna, resent the military occupation of their homeland & are determined to let the outside world know what life is really like in post-war Hungary. Philip has written the inflammatory articles that Rosemary has read & Anna has smuggled out of the country. They are playing a dangerous game as the authorities are not amused & Naniescu is determined to prosecute the author. Rosemary discovers what Philip & Anna have been doing but is sworn to secrecy. However, it soon becomes obvious that her trip to Hungary was all part of a plan by General Naniescu. He arrests Philip & Anna, they are imprisoned & charged with treason. Naniescu presents Rosemary with an ultimatum. She is to write a series of articles praising the new regime or else Philip & Anna will be tried by a military tribunal & almost certainly sentenced to death. If she agrees, they will be released & allowed to leave the Romanian occupied territory & live in Hungary. Rosemary is torn between her love for the Imreys & her integrity as a journalist. She also realises that by saving two people, she will be condemning thousands of other Hungarians as her reputation as a journalist is such that her opinion of the new regime will influence policy makers in Europe & convince them that all is well & to leave Hungary alone. At the same time, Rosemary is becoming concerned about her marriage. Jasper is almost cringingly devoted to her & anticipates her every need although at times the intensity of his passion for her is frightening. She can't stop thinking about Peter, who also visits Hungary, ostensibly to arrange a cricket match, but Jasper tells Rosemary of rumours that Peter is working for the new Romanian regime. Rosemary is desperate to help the Imreys but it seems that all her efforts are in vain as the mysterious spy, known only as Number Ten, appears to be manipulating both the Imreys & Naniescu for reasons of his own. Unsure who to trust, Rosemary must discover the truth, no matter how personally devastating it may be. Jasper is my friend, and I would not harbour one disloyal thought against him. But you being the wife of an enemy or of my best friend is beside the point. I cannot shut you out of my life, strive how I may. Never. While I am as I am and you the exquisite creature you are, so long as we are both alive, you will remain a part of my life. Whenever I catch a glimpse of you, whenever I hear the sound of your voice, my soul will thrill and long for you. Not with one thought will I be disloyal to Jasper, for in my life you will be as an exquisite spirit, an idea greater or less than woman. Just you. If you are happy I shall know it. If you grieve, Heaven help the man or woman who caused your tears. I have been a fool; yet I regret nothing. Sorrow at your hands is sweeter than any happiness on earth. I thought Pimpernel and Rosemary (cover picture from here) was a complete romp. I enjoyed the Hungarian setting. Baroness Orczy was Hungarian & used her knowledge of the country to good effect in her beautiful descriptions of the countryside & the Imreys' estate of Kis-Imre. The slightly faded old-world charm of the Imreys' life with its privilege & its arrogance is implicitly compared with that of the aristocrats before the French Revolution who were rescued by the original Scarlet Pimpernel. The updating of the story to the early 1920s is made explicit in the illustration on the cover above where Peter is overshadowed by his illustrious ancestor Sir Percy. I'm not sure that I could read all ten of the sequels to the original novel, actually I'm positive I couldn't! There were also two prequels about ancestors of Sir Percy (The Laughing Cavalier & The First Sir Percy) as well as Pimpernel and Rosemary. Interestingly there doesn't seem to be a novel that was the basis for Pimpernel Smith, a 1941 movie starring Leslie Howard (who played Sir Percy in the 1934 movie with Merle Oberon as Marguerite) as a WWII era Pimpernel. The movie was based on an original story by A G Macdonell who wrote the novel England, Their England. Baroness Orczy isn't even credited. 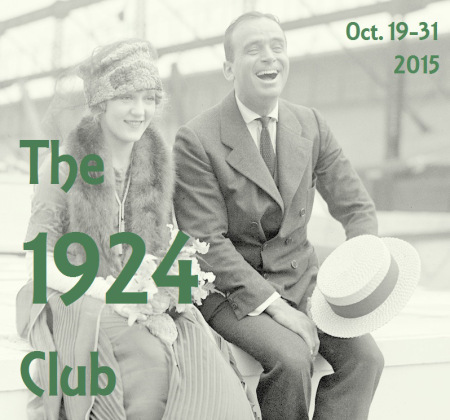 I also have to confess that I relaxed my book-buying ban for the 1924 Club by buying the eBook collection of four Pimpernel novels for 73 cents. I just couldn't resist the idea of an updated Pimpernel novel set in Hungary. My excuse was that Simon set the challenge of finding obscure novels written in 1924 & I thought I should take up that challenge after reading the better-known John Buchan novel earlier in the week. Fantastic discovery for this challenge! Sometimes it's fun to just revel in purple prose, and the updating of the Pimpernel story sounds entertaining. It was very entertaining even though the prose was very over the top. I loved reading about Hungary too. What a great find. I know very little about her works, other than the standard Pimpernel reads, which as a teenager I adored. Pimpernel Smith is one of my all-time favourite films, a great update of an original. Interesting to note that Leslie Howard starred in both. I'm sure I saw Pimpernel Smith many years ago but I would love to see it again. I've seen the Leslie Howard Scarlet Pimpernel many times. I also didn't realise one of hers was set in present day - or what was then present day! - and given my dislike for historical fiction, this might be the one I'd be tempted to pick up. But that writing! I definitely wouldn't be able to take anything seriously, but it does sound like it would be amusing to read. I'm not sure you'd enjoy her prose, Simon (remember Mary Webb?) but I think if you're going to read any of the Pimpernel series, this will be the one. The Hungarian setting was also fascinating. I've heard about the sequels to the Pimpernel, but I've never heard of this one! Nor did I know how long she continued to write them. The Hungarian aspect of this story does sound really interesting. I was surprised that she was still alive, let alone writing in the 30s & 40s. I'd like to read more of her other detective stories, like Lady Molly. Thanks Val. It was perfect escapist reading during a very busy week at work. Fascinating, I thought I'd read most of the Pimpernel books in my early teens, with steadily diminishing returns, but this one is new to me. I'm not sure that it's one to look out for though, however lovely the Hungarian setting! If you like your prose spare & to the point, I wouldn't bother with this one! I hadn't know about this embarrassment of riches, Lyn. Thanks for this post. I have several of the sequels now on my wish list. Soon, they'll be on my Kindle. I had always thought THE SCARLET PIMPERNEL was a stand alone. Little did I know. I haven't read any of the other Pimpernel sequels except this one but there are quite a few of them. Hope you enjoy them. How interesting. Thanks for the link to the details of your book. I've only read the original novel (many years ago) & now this one. I have LTW in my eBook collection so I may have to read it.